Rev. Edward Girdlestone, nominated by George IV, was instituted Vicar of Deane in 1830. Immediately after leaving college he became private tutor to William Ford Hulton, eldest son of William Hulton, Esq. He also had other private pupils. In 1829 he was appointed a curate at Deane, and became vicar when Thomas Brocklebank resigned the living. He was interested in the work of Day and Sunday Schools in his own parish and further afield. He preached a course of four sermons on "George Marsh, the Martyr of Deane," which aroused so much interest that he was persuaded to publish them. A copy of the book is now included in our library. In 1834 he was appointed to the office which had been held by his predecessor, whereby he was required to visit cotton mills. 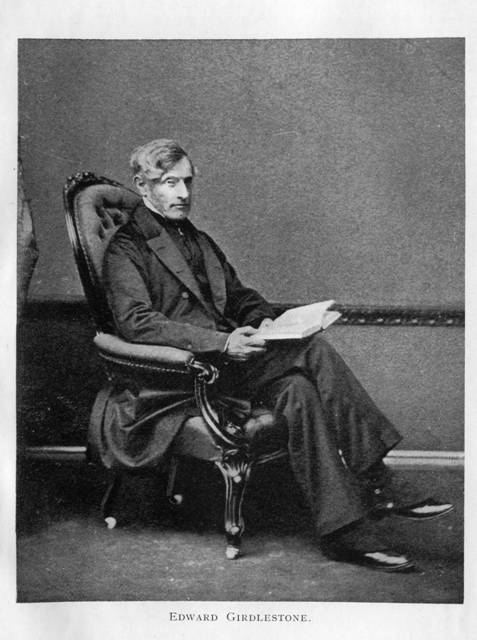 He was appointed Canon of Bristol Cathedral in 1854, and resigned the living of Deane the following year.